[me]*hugs u wen u get out and whispers 2 u*O.O...y r u blushing!?!? !i'd u'd b beating his a$$ right now!?!?! me:*blushing bright deep blush and still in shock*..whispers softly to you...I don't know?!?!?!?!?!?!?!?!?!?! me:*blushing bright deep blush and still in shock and turns away my back to kakashi and stairs at the wall*....thinking...why am I blushing and I don't get it was is kakashi acting that way to me if he's not trying to be a pervert to me...I can't like him...I've allways hated him...right?!?!?!?!?!?!?!?!?!?!?!?!? iruka:..*lightly blushing about you and smiles*..thats good to hear....i wanted to say I was sorry a long time....*sits on the ground beside you and blushs more*......do you still hate me kazumi???? me:*blushing bright deep blush and still in shock and back to kakashi and stairs at the wall*....thinking...no I can't like kakashi that way....he is on'y tricking me so he can be mean like he allways use too....I need a drink perfferably saki but there is none here!! !...dame my face is still red for the kiss....DAME YOU KAKASHI!!!!!!...URG!!! [me]*sighs*yea and this way they can see who needs help in wut and wut they can each other with. slaps him as i pull away blushsin ang quickly turn my self 2 the wall*hmp! 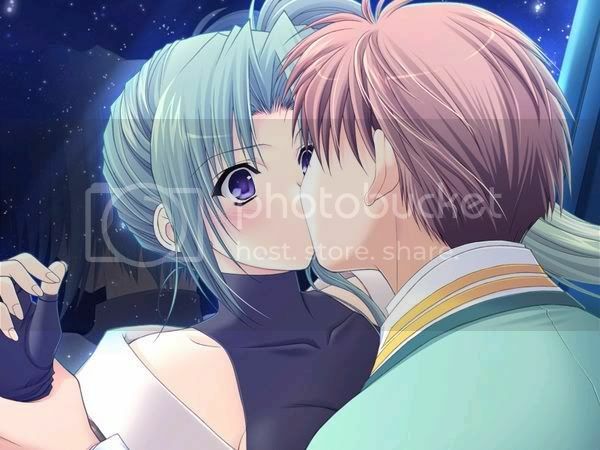 kaze:*comes over smirking*.....hay ayumi sensei why are you blushing???? kaze:*cleaning himself off and smirks*..you are blushing and you did something in the closet with kakashi sensei didn't you???? me:*blushing a deeper red and anime vain*.....DON'T ASK YOUR SENSEI THOSE KIND OF QUESTIONS....NOW DON'T ASK AGAIN!!! iruka:..*lightly blushing about you and rubs his cheek smiling*...kazumi I can say I'm sorry but I'm not....I wanted to kiss you for the longest time....I never ment it to be in anyway to seem I'm trying to push myself on you and the only thing on teanding on doing was a kiss nothing more honest...I don't think you are as mad as you would usualy would or I would be in alot of pain intead of you just slaping me.......I think you were blushing..were you kazumi????.. me:*blushing a deeper red and hugs you when I see your face*.....whispers to you.....what happen?????? [kakashi]*lightly blushing about u and smiles rubbing his cheek*u kiss her and get slapped 2? [me]*blushing and feeling dazzed and upset**whispers back*it felt..weird..and now my tummy feels all funny inside..
me:*blushing a deeper red and huging you*.....whispers to you.....I hate saying this or thinking this but if I say it to you I have to say it to myself....I think..*glups*...it might be a crush....*gups again*...but what do I kknow....you could be feeling up set about what happened.....nah that can't be it..you realy dislike him right?!?!?!?!?!?!?!?!?! ?.....thinking....no I can't be crushing ion kakashi thats impossable after all the years not like each other.....is it possable though to hate someone for so many years grow to like them...nah thats just stupid talk and jumbled thoughts is all....or is it??? ?....URG DAME YOU KAKASHI YOU GOT ME QUESTIONING MYSELF....I CAN'T HAVE ANOTHER PRVERT I LIKE THE LAST BOYFIEND WAS A JERK AND LEFT ME FOR ANOTHER GIRL BECAUSE SHE DID THE ONE THING THAT I DIDN'T......NO I DON'T LIKE KAKASHI AND THATS FINAL.....OR IS IT...AHHHHHHHHHHHHHHHHHHHHHH SHUT THE F*CK UP BRAIN AND THOUGHTS OF KAKASHI KISSING ME GO F *CKEN DIE ALREADY!!!! iruka:..*lightly blushing about you and rubs his cheek smiling*..
[me]*blushing and feeling dazzed and upset**whispers back*no,that cant b it.i dont get crushs!! iruka:..*lightly blushing about you and rubs his cheek smiling*....whispers to kakashi...how much do you like ayumi???? [kakashi]*lightly blushing about u and smiles rubbing his cheek*a lot.id burn my books 4 her. [me]*blushing and feeling dazzed and upset**whispers back*idk..iruka said he wasnt tring 2 force himself on me so..idk..
[me]*blushing and feeling dazzed and upset**whispers back*the scariest thing was i felt..like kissing back..
me:*blushing a deeper red and huging you*.....whispers to you.....I fealt the same way...I was thinking how it fealt so good to have him kiss me..werid huh?!?!?!?!?!? [kakashi]*lightly blushing about u and smiles rubbing his cheek*yea me 2..
[me]*blushing and feeling dazzed and upset**whispers back*im scared this feeling confusses me..
[kakashi]*lightly blushing about u and smiles rubbing his cheek*so worth it..*out loud*hey naruto u guys gonna finish ur game?? [me]*blushing and feeling dazzed and upset**whispers back*at least u'd b able 2 tell if u like him or not..i dont no how it feels..
naruto:*smirks*...yea I'm going to finsh the game....*tells Kurenai..I forgot her name and she gets asuma*.......ok for the rest of us..the next to go is..*looks at kimko*....kinko its your turn..
[kakashi]*lightly blushing about u and smiles rubbing his cheek*yea..
[me]*blushing and feeling dazzed and upset**whispers back*BUT I DONT WANNA!!!! me:*blushing a deeper red*.....whispers to you.....*sighs*...eather do I after all the hell they put us through.....dame them smug a$$'s act like the can turn on the charm on us and make us feel something for them they got to be dreaming and I'm not falling for it!!!! [me]*blushing and feeling dazzed and upset**whispers back*me either!! me:*blushing a deeper red and an huge anime vain and twitchingand quickly shoves him off and he falls back*...N.A.R.T.OOOOOOOOOOOOOO!!!.. *growls realy loud with my fest clinched next to my sides twitching and blushing from kakashi and the embrassment*..GRRRRRRRRRRRRRRRRRRRRRRRRRRRRR!! [me]*blushing a deeper red and an huge anime vain and twitching and quickly shoves him off and he falls back*NARUTOOOOOOOOOOOOOO!!!!!!!!!!!!!! *growls realy loud with my fest clinched next to my sides twitching and blushing from iruka and the embrassment*..GRRRRRRRRRRRRRRRRRRRRRRRRRRRRR!! [kimko]*pissed*ur the moron y dont u try 2 make me shut up cuz im not gonna!!!! me:.....N.A.R.T.OOOOOOOOOOOOOO!!!.....GRRRRRRRRRRRRRRRRRRRRRR..... *growls realy loud with my fest clinched next to my sides twitching and blushing from kakashi and the embrassment*..
me:.....*growls realy loud with my fest clinched next to my sides twitching and blushing from kakashi and the embrassment*..NARUTOOOOOOOOOOOOOOOOOOOOO SHUT THE F*CK UP AND RUN YOUR IN A WORLD OF HURT!!!!!!! me:*fist clenched at my sides and an huge anime vain and blushing from kakashi and the embrassment and growls loudly and runs after him with you*...COME OUT FROM THERE NARUTOOOOOOOOOOOOOOOOOOO!!!!.. *looks at you with an evil smirk*...ITS WISH BONE TIME KAZUMI.....YOU TAKE A LEG AND i WILL TAKE A LEG AND LETS MAKE A WISH!!!!!!!!! naruto:*screams and is confussed what I ment by wish bone*..AHHHHHHHHHHHHHHHHHHHHHHH..WTF DO YOU MEAN WISH BONE?!?!?!?!?!?!?!?!?!?!?!?!?!?!? me:*smirks evily and looks at naruto with an evil perncing glare and blushing from kakashi and the embrassment*..YOU WILL SEE!!! [me]*growls realy loud with my fest clinched next to my sides twitching and blushing from iruka and the embrassment*..
me:*smirks evily and looks at naruto with an evil perncing glare and blushing from kakashi and the embrassment*..GRRRRRRRRRRRRRRRRRRRR..*quickly disapears and reapears bhinde iruka and kakashi and quicly picks naruto up by one of his legs and holds him in the air and reapears by you*...I GOT THE LITTLE PERV....LETS MAKE A WISH!!! naruto:*screaming and hang upside down by me holding him in the air by his leg*..AHHHHHHHHHHHHHHHHHHHHHHH..HELP ME IRUKA SENSEI AND KAKASHI SENSEI!!...AHHHHHHHHHHHHHHHHHHH!! iruka:*annoyed and pissed at naruto*..sorry naruto can't help you with this one..you made your bed now you have to lay in it!!!!.. me:..*holding naruto up by one of his legs in the air anime vain and blushing from kakashi and the embrassment and growls*...KAZUMI SHOULD WE MAKE HIM SCERM FIRST????? naruto:*screaming and hang upside down by me holding him in the air by his leg*..AHHHHHHHHHHHHHHHHHHHHHHH..
me:..*holding naruto up by one of his legs in the air anime vain and blushing from kakashi and the embrassment and growls*...KAZUMI HOW SHOULD WE MAKE HIM SCERAM?? ?